It used to be frustrating asking Boris Johnson, London’s mayor until May last year, about transport policy issues. During my first stint as a transport correspondent, from 2003 until 2011, I recall asking him about his determination to remove the western extension of London’s congestion charging zone, to introduce new cycling facilities as mere blue-painted lanes down busy main roads and replace London’s efficient, articulated buses with a lower-capacity, double-deck vehicle loosely based on a much older vehicle. All the concerns were shrugged off, with Johnson’s trademark insouciance. All those ideas are now recognised, to a greater or lesser degree, as bad ones that either should have been better thought through or not implemented at all. 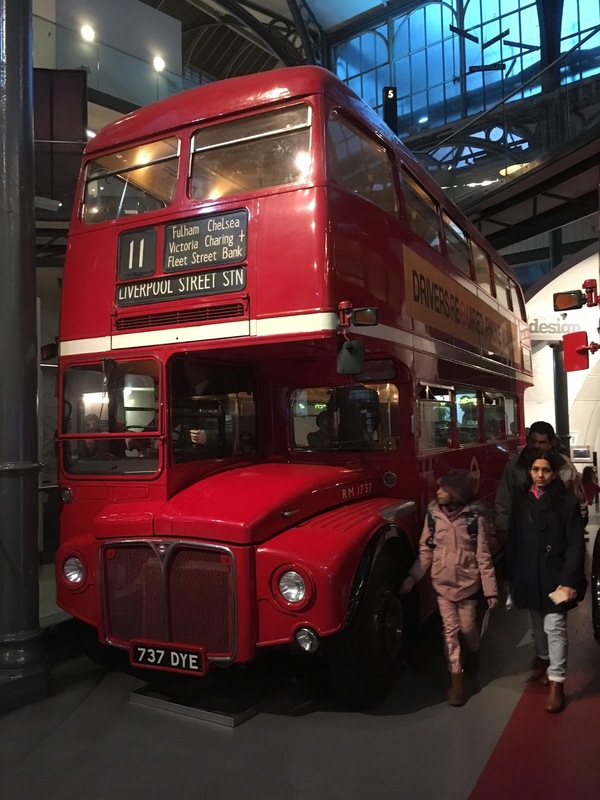 Congestion in west London rose; the painted “superhighways” proved tragically dangerous and the new bus has become an expensive joke that has helped to damage the performance of London’s bus networks. The mayor, meanwhile, went on to be a leading figurehead of the movement calling for the UK to make one of its biggest, most poorly thought-out policy decisions since the second world war when it voted to leave the European Union. This past week, however, has left me with the impression that far more people approve of the former mayor’s style of policy-making than I had suspected. 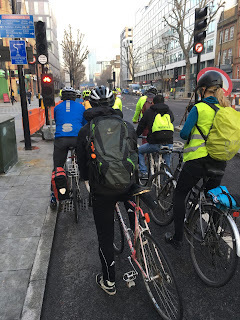 Since I posted on Monday a blogpost calling for cyclists to face the reality that London’s roads are growing steadily more congested, I’ve faced a series of criticisms. Many of them have focused on my argument that cyclists have to recognise that our aspirations to get further dedicated space for cycling facilities mean we are in competition for scarce road space with other road users, who face growing congestion. Cyclists ought, I argued, to take an interest in the problem and in measures to rein it in. In particular, I was the subject of a blogpost by Andrew Gilligan, who worked as Boris Johnson’s cycling commissioner. He accused me, essentially, of cherry-picking evidence to suit my position and asserted, based on Transport for London’s Journey Time Reliability figures, that congestion wasn’t really getting worse at all. The various criticisms I’ve faced have fallen into a series of broad groups. Several people argued that there was no real trade-off between cycling and other modes. Others contended that other road-based modes were so much less worthwhile that any trade-off was worth it even if it, say, caused serious inconvenience to people making the 6.5m daily trips by bus in London. Finally, there was a strain of thought that I was mistaken in even my attempt to put cycling in a broader policy context. Cyclists should make the argument for cycling provision and forget about anything else. I’d class all of these criticisms as falling, like Johnson himself, within the Cavalier tradition in British public life - that the depth of one’s convictions and the elan with which one states them are more important than the pettifogging details of the statistics. However, a report on Thursday from the London Assembly’s transport committee has reinforced my conviction that my cautious approach to public policy - which I’d class as being in the Roundhead tradition - is in the ascendant, in London at least. The report acknowledged the growing congestion crisis and that the recent worsening in conditions reflected a shrinking of the road network’s capacity for multiple reasons. It advocated - as I do - pressing ahead with new, high-quality cycle provision such as the segregated cycle superhighways. However, it also said it was vital to introduce road-pricing - as opposed to a simple congestion charge for entering central London - to relieve the pressure on the roads. I very much hope - although I doubt that the current mayor has the political courage for it - that the assembly members’ recommendation will be followed. I also hope that the debate over the issues can become more constructive than it feels to me after a week that’s marked a fairly miserable fifth anniversary for this blog. The focus of much of the criticism, however, has been my reference in the last blogpost to a point that ought, in a rational world, to be uncontroversial. This was to point out that central London’s congestion is worsening and that it is likely that the building of wide cycle tracks along some of central London’s key arterial roads - and the addition of some cyclist-only phases at junctions - contributed to this. I made the point not because I disapprove of the cycle tracks’ building - I enthusiastically endorse them - but because of the implications for the future. Anyone who wants an extension of the existing tracks needs to gain the approval of planning authorities and a mayor’s office already facing substantial pressure because of the road network’s deteriorating performance. There seems to me to be little likelihood that a mere restatement of the now-conventional wisdom that the cycle superhighways are unrelated to traffic delays is going to win over many of the people that need to be persuaded. affecting the neighbouring motor traffic. As I pointed out in the original post, the average speed of traffic in central London has fallen in the most recently-published figures despite a substantial fall in the volume of traffic on the roads, a phenomenon that most observers attribute to a shrinking of the network’s capacity. 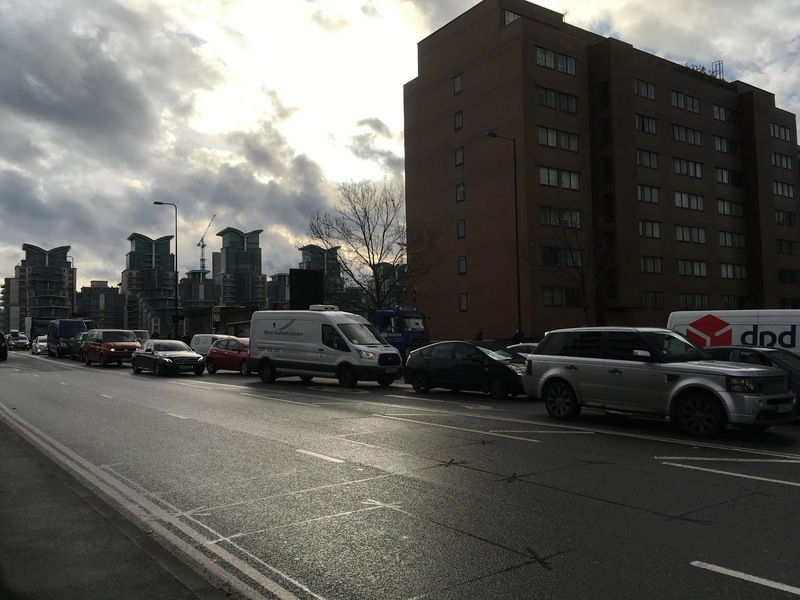 While it’s true that the network’s capacity started to fall well before the cycle superhighways were built, there’s little serious doubt that the superhighways are contributing to delays for motor vehicles. An update in November on implementation of the schemes said that journey times for motor vehicles southbound alongside the north-south cycle superhighway had returned to pre-construction levels since completion of the project. All other traffic flows alongside the superhighways were longer, however. 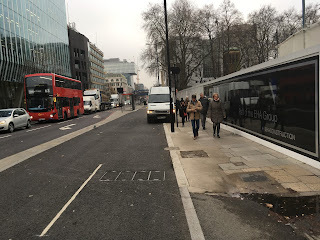 The added delays included eastbound journey times alongside the east-west cycle superhighway that were 10 to 15 minutes longer in the evening peak than before the facility was put in. The roads concerned will undoubtedly have been affected by the wider worsening of congestion in the period in question and the changes will no doubt, like all changes to road networks, bed down as drivers adapt their behaviour to cope. But it seems profoundly improbable that the big changes to traffic flows have not contributed to this slowing and it is impossible that this substantial slowing of some journeys has not played a part in the declining average speeds reflected in the statistics. It was my reference to the superhighways’ effects that prompted Andrew Gilligan’s response. Referring to me by my title in my day job - something I’ve tried to keep scrupulously separate from my free-time blog - he accused me of using figures that were “selective” and that the true indicator of congestion was quite different. At least one person treated this post as definitive proof that I was wrong. “Watch @mragilligan use knowledge and stats to destroy @RKWinvisibleman 's recent argument that cycle lanes are causing London congestion,” wrote @BrixtonHatter on Twitter, linking to Gilligan’s post. Yet Gilligan’s arguments seem at odds with nearly everyone's experience. His argument that congestion isn’t getting much worse pre-supposes that the ever-slowing movement of London buses and logistics companies’ dwindling productivity are mere fever dreams. Any anecdotal evidence - the fact, for example, that I often now have to pick my way between halted vehicles to buy my lunchtime sandwich, whereas the danger used to be moving ones - is also to be disregarded. In fact, the reason why I didn’t quote Gilligan’s favoured measure of congestion - journey time reliability - is that the average speed figure that I used more accurately captures the nature of this problem. The reliability figure tracks the proportion of vehicles that complete trips in more than five minutes longer than the average time over the previous year. It consequently measures the frequency of severe, one-off disruption. Its use of previous average speeds means it is designed to screen out the kind of gradual, strangling congestion that is steadily choking London. anecdotal evidence that it seems I must disregard. My central point remains. It must, in my view, be a serious problem if average daytime traffic speeds in the centre of London - a place where motor vehicles are needed to serve a big upsurge in building and infrastructure work, to carry people in buses and to make deliveries - have dropped as low as 7.8 mph. Members of the London Assembly’s transport committee seem to share many of my concerns. In the foreword to their London Stalling report on congestion in the capital, Caroline Pidgeon, the committee’s chairwoman, wrote that congestion had begun to rise sharply. The report went on to list a very Roundhead set of recommendations - ideas based on careful attention to the statistics, rather than the kind of sweeping, grand gesture that used to be the rule under the previous mayor. 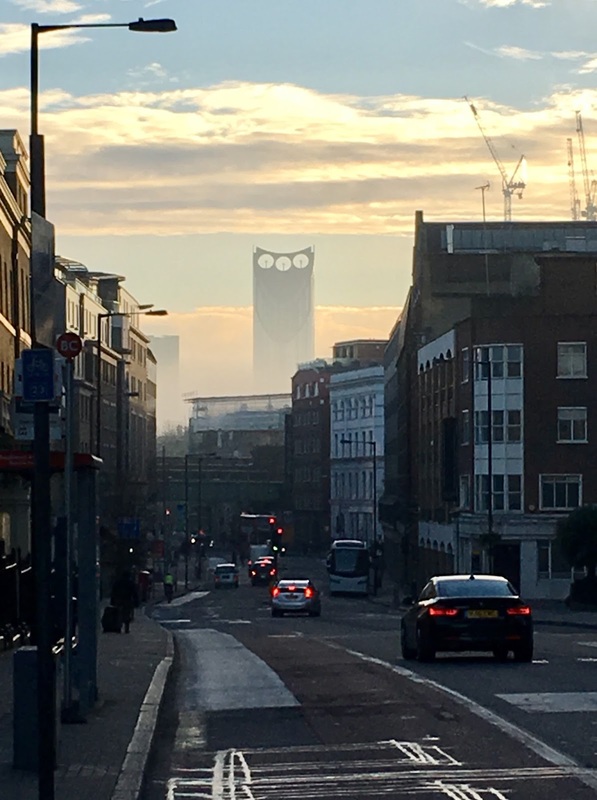 While I am delighted that the existing superhighways have been built and grateful to Andrew Gilligan for his central role in that achievement, it seems vanishingly unlikely that either Sadiq Khan or the assembly’s transport committee will sign off on a significant extension if it will produce a further worsening of congestion. It is hard to imagine some of the arguments I’ve heard this week will succeed in swaying the current mayor. It is inherently implausible, for example, that the mayor will allow measures that significantly delay bus passengers to benefit cycling, which currently accounts for just 700,000 daily journeys across the capital. As with nearly every other public policy question, measures to favour cycling are subject to trade-offs with other choices in which policymakers have to balance competing interests in as equitable a way as possible. But the ultimate question for me doesn’t involve politics, policy arguments or the different personality types of the people involved. 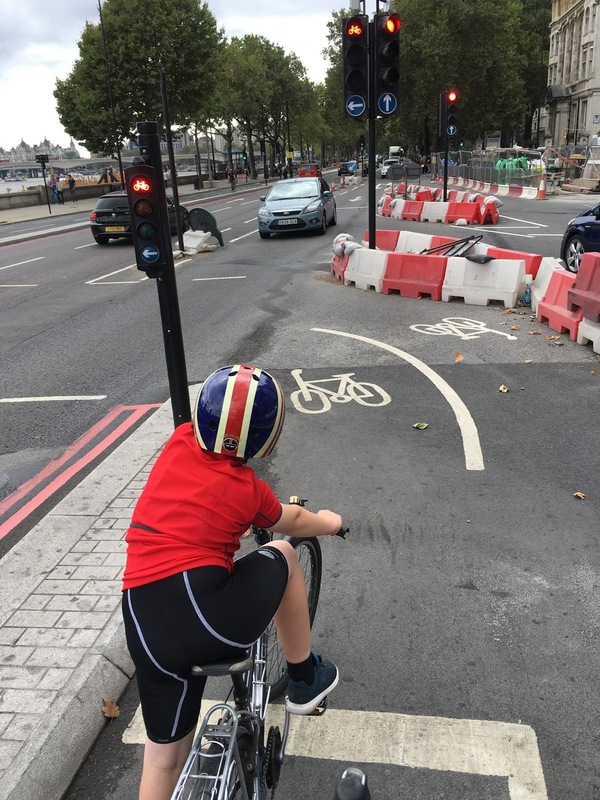 It’s that my children since we returned to London from New York in July have become much keener on cycling in central London, thanks to the cycle superhighways. I want to see them extended so that we need do far less jostling with aggressive drivers to reach them. The Cavaliers had the chutzpah to get the existing facilities built. Perhaps their current strategy - berating the uselessness of everyone concerned, questioning their motives and insisting that no trade-offs are necessary - will succeed again, despite my concerns. But my guess is that the next push will require more of a Roundhead’s recognition of the complexity of the policy challenges and readiness to get to grips with them. I hope that such sober thinking will grow far more widespread than it seems to be at present. Before I got out on my bike, I was anticipating that Monday, January 9, was going to be my smuggest cycling day since returning to London from New York in July. A strike by station staff on the London Underground had brought the busiest bits of the capital’s most important public transport system to a halt. And, as I sat at home writing initial stories about what was happening, I noticed account after account of chaos on the roads as would-be underground users turned to cars and buses to get to work. I imagined myself slipping casually through the traffic on my bike, warmly congratulating myself on the excellence of my transport choices. In the event, the day ended up feeling less like a triumph and more like a reminder of the acuteness of the transport policy challenges facing London. By the time I left home to ride to the office, around 10am, the bus lanes that I’d normally use for the early stages of my journey were choked with other forms of motor traffic. Progress was so slow I retreated to the side streets, which in places were little better. demonstration of London's reliance on its underground. The incident dramatised an issue that’s been worrying me for some time. London’s roads become congested when people are emptied out of the underground and other non-road forms of transport onto the roads. Yet it’s an uncomfortable truth of campaigns to encourage cycling in inner London that the vast bulk of the growth in cycle commuting must be coming from a similar, slow-motion shift from rail-based modes onto already over-stretched streets. More and more complex demands are being heaped onto constrained roadspace, without much sign of a strategic plan to manage the resulting pressures. On top of that, I noticed once I got to work how many twitter users were complaining of having hours spent on buses even on short journeys. Later in the week, would-be commuters on Southern, the mainline rail service, would undertake similarly unpleasant journeys during strikes by their service’s drivers. The stories illustrated the shortcomings of decades of efforts to encourage cycling. Cycle provision in most of London still consists of signed routes down backstreets, most of which are growing ever busier and less attractive. It’s clear that most people will not consider riding on these, even in the most desperate circumstances. Faced with placating demand for better cycle provision and the challenges of congested, polluted roads, Sadiq Khan, London’s mayor, seems anxious about building more of the direct, segregated cycle routes that might get such reluctant cyclists pedalling. The challenge for everyone in London who wants more, safer cycling in central London is to devise arguments for better provision that recognise the new realities. It’s vital as the system accommodates growing cycling to safeguard road provision for the buses, delivery vehicles, emergency vehicles and other vital road-users that make up a high proportion of central London’s current road users. The challenge is similar for advocates in other big urban centres - including New York, my old home - where people shift to cycle commuting mainly from modes that don’t depend on the roads. to cycling before the roads get even more congested? Yet some of the most influential figures on London’s transport scene continue to insist that the conundrum is so simple it barely exists. On January 5, Andrew Gilligan, London’s former cycling commissioner, tweeted a graph from Transport for London’s latest “Travel in London” report that attributed 75 per cent of London’s congestion to “excess traffic”. The conclusion was “blindingly obvious to all but motorists,” he wrote, dismissively. A little digging into the statistics for central London fills in the details of the policy dilemma. Traffic volumes entering Central London fell 3.4 per cent between the June to September quarter in 2015 and the same quarter in 2016, part of a long-term decline that’s seen the volume of motor traffic entering central London decline by more than 20 per cent since 2000. Instead of increasing with declining traffic volumes, however, average traffic speeds in central London - the easiest available proxy for congestion - fell 3.5 per cent, to 7.8mph. The network’s capacity is very clearly falling even faster than motor vehicle are going away. The amount of traffic that it takes for traffic to become “excess” is falling. It is not clear, either, which part of the traffic can easily be reduced to alleviate the problem and free up space for cycling. The same Travel in London report that Andrew Gilligan quoted says that private cars now account for only 18 per cent of motor traffic during weekdays in the central London congestion charging zone. The other vehicles - private-hire cars, taxis, vans and heavy lorries - all have at least some arguable economic reason to be in the area. They are likely to be more resistant than private vehicle owners to stopping driving in the area. One of the most popular suggestions among cyclists for reducing the traffic is that more of the growing numbers of internet deliveries being made in central London could be shifted to cargo bikes. The idea is sufficiently attractive that I investigated the subject in my day job for a piece about the growing numbers of cargo bikes I see around central London. Yet I emerged from interviewing even courier companies that use cargo bikes a little depressed. While cargo bikes were helping them to make urgent deliveries despite the heavy traffic, courier companies told me, they would always be a niche vehicle compared with the vans that were their fleets’ mainstays. Amid this growing crisis, meanwhile, the one unutterable suggestion among cycle campaigners is that the building of segregated cycle superhighways along a number of central London roads might be contributing to the problem. When Florence Eshalomi, a member of the London Assembly, asked cyclists on twitter on January 11 whether they agreed with a senior TfL manager that cycle lanes had had some impact on bus journeys, the replies mostly struck a similar note. “Making London a byword for cycling is more important than bus usage,” one twitter user replied. The replies drew on the now-conventional wisdom among London cyclists that the 12 miles of new cycle superhighways in central London - which I love using, especially when with my children - have had no significant effect on congestion. The facilities, however, have been put in on arterial roads that were already operating at or near full capacity. They have, crucially, introduced new, cyclist-only light phases that can only have introduced extra waiting time for motor vehicles both on the streets with the new facilities and those crossing them. on what goes on on the rest of the road, it's said. 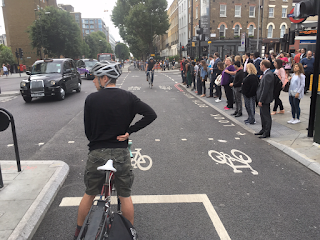 While there are plenty of other factors restricting London’s road capacity, it seems fanciful to imagine that cycle facilities alone can remove capacity from busy roads and have little effect on congestion. It is certainly clear the capacity of London’s roads fell around the time the new facilities were built. It is not unreasonable, it seems to me, for Sadiq Khan and Mike Brown, commissioner of Transport for London, to seek to reduce the effect of any new facilities on congestion before giving them the go-ahead. Yet to say that the challenges facing London’s leaders are hard is very definitely not to say they are impossible. It is quite clear, for example, that action that reined in the growth of services such as Uber in central London could have a significant effect. Private hire vehicles - the vehicles that provide the Uber service - now account for 12 per cent of traffic in central London on weekdays. 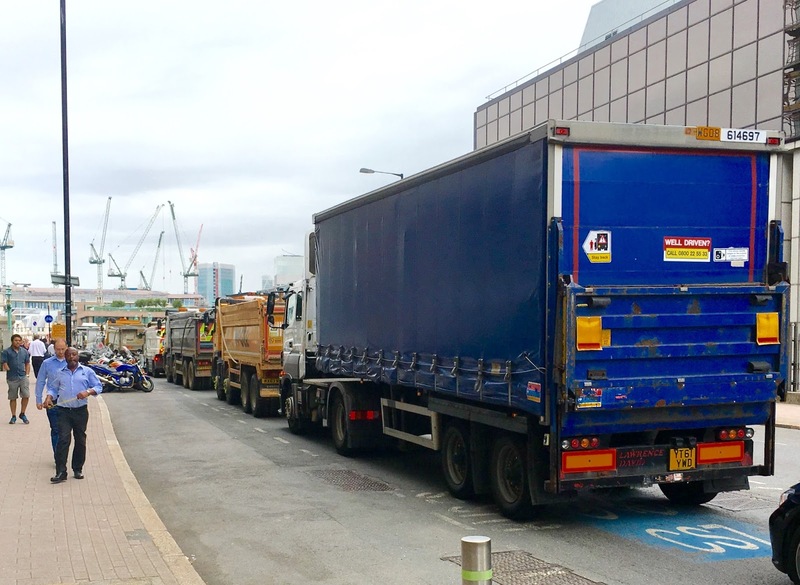 Any measure that makes deliveries to the scores of construction sites in central London more efficient could free up significant amounts of road space. It is hard to understand why low-emission vehicles, which take up the same road space as others, remain entirely exempt from congestion charging. 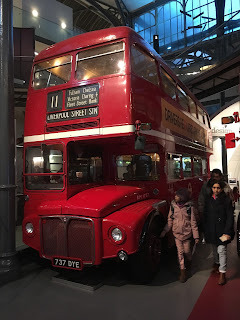 It is regrettable, meanwhile, that London relies so heavily on the double-deck New Bus for London given its poor capacity and the time it takes to load and unload. A wholesale reform and extension of the current central London congestion charge to make it more sophisticated and more closely related to the space each vehicle takes up on the road seems overdue. The mayor should continue to pursue increases in cycling because bikes provide clean, healthy, flexible transport. Extra cycling journeys can almost certainly be catered for more economically than extra journeys on the underground. It is far too easy, however, for the debate over this complex issue to slip into glibness. Taxi driver groups slip into this trap when they claim the simple removal of new cycle paths would restore London’s roads to flowing freely. Cycling groups fall into it when they pretend new cycle paths magically shift London commuters from wasteful cars onto space-efficient bikes. The rest of my ride to work on January 9 was a stark reminder of the risks of ducking serious debate. 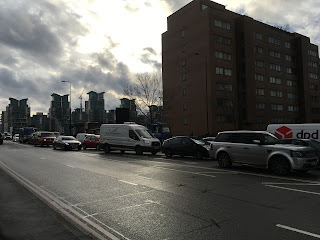 I encountered drivers engaged in fierce rows over road space, a furious woman cyclist yelling at a man who had somehow wronged her and, in van after van, long lines of stressed-looking delivery drivers and workmen. An air of unhappiness and frustration hung over everything. While the scenes were far worse than those on a normal day, I made an inward vow to renew my efforts to think more seriously in future about the less acute but still worrying levels of congestion I encounter daily. If others do the same, it may prove easier to build wide support for the kind of excellent facility I found myself using towards the end of the trip. Wanting to take in the scene, I rode over Vauxhall Bridge then down the east-west cycle superhighway along the Embankment. As van and taxi drivers sat motionless in the neighbouring traffic jam, I was finally slipping by the traffic jams, as I’d anticipated. Looking at the grim faces of the stationary drivers, it was a pleasure I was keenly aware I shouldn’t take for granted.